Love is in the air! It’s the week (as every week should be!) to show extra gratitude and love to your special someone. And, of course, that will always include food! This week, we will be featuring recipes to show some love to your favorite someone. I’ve made sure the recipes are indulgent, have aphrodisiac qualities, taste delicious, and are in the PERFECT portion and have the PERFECT potion for love! Everyone knows chocolate is the ultimate aphrodisiac—the power lies in both the sedative and stimulating properties—chocolate relaxes and loosens inhibitions, and increases desire. 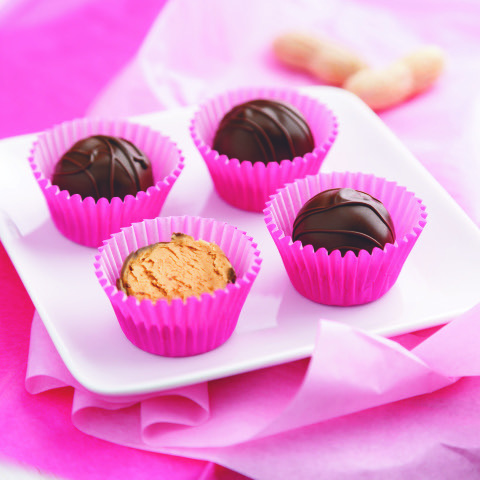 Is there any better pairing than chocolate and peanut butter? The combined textures of these two ingredients will set you on fire! Enjoy! Plus, the perfect portion to make this yummy dessert guilt-free and enjoyment-filled! In a mixing bowl, mix the peanut butter, butter, vanilla extract, and salt until smooth and combined. Fold in the confectioners’ sugar to form a peanut butter dough. Roll the peanut butter dough into 24 equal balls (using about 1 1/2 tablespoons of dough each) and place onto the prepared baking sheet. Cover and refrigerate for 30 minutes. Create a double boiler by placing a stainless steel or tempered glass bowl over a pot of simmering water. Add the chocolate chips to the bowl of the double boiler and heat, stirring frequently, until the chocolate is melted and smooth. Remove from heat. Using a fork, place one of the chilled peanut butter balls in the melted chocolate and roll until fully coated. Gently lift the truffle out of the chocolate and tap the bowl to remove any excess coating. Transfer back to the sheet pan. Repeat this process until all 24 truffles are coated. Refrigerate for at least 30 minutes, or until the chocolate coating has set. Store covered and refrigerated for best texture.